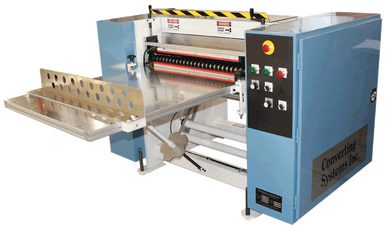 Separator Options, Add-ons, Upgrades - Converting Systems Inc.
CSI has redesigned our Separator Table Extension, making it easier for operators to set-up and adjust as needed. New streamlined extension slides out to provide an additional 26” of work surface to accommodate larger bag sizes (70” maximum with extension). Available in 50”-100” widths (larger sizes available). New “1-click” magnet design allows the fence to be re-positioned quickly and easily without extra hardware or jamming. New tool-less knobs lock extension in place – no more tools required or lost screws. Perfect for GEC machines and separator rebuilds. This new tool-less design supports our goal to provide more operator friendly machines to our customers.